As mentioned earlier, in order to make estimates on future crop yield with remote sensing data alone, we need to know the relationship between vegetation indices at a particular growth stage of the crop and the final crop yield. Historical data of previous growth seasons, serve this purpose, and the accuracy of the crop yield prediction increases as the amount of historical data increase. However, no two growth seasons are the same. The different climatic conditions, the presence and intensity of stress factors and the treatments applied by the farmer, all vary between the years and play a crucial role in determining the final crop yield. In order to make more accurate predictions, it is essential to consider the factors that affect crop growth and yield in the current year. Information such as meteorological and climatic data, soil properties and farming practices are combined with the up-to-date remotely sensed data, in order to model the crop growth and make estimates on the final crop yield. One such example is the	Mars Crop Yield Forecasting System (MYCFS) operated by the MARS (Monitoring Agriculture with Remote Sensing) STAT sector of the Agriculture and Fisheries Unit of the Joint Research Centre (JRC). In addition to meteorological data and farming practices, geographical information is also included in some models. For example, the field inclination (slope), along with soil properties can provide useful information on the behaviour of surface water. This is very important when the run-off of fertilisers or pesticides to lower elevations needs to be estimated. It is also very common to use a Geographical Information System (GIS) in order to store information related to particular fields or areas. In addition to the estimated crop yield, other information includes the type of crop or crops cultivated during the season, the owner of the field(s), the soil properties, as well as historical information such as the farming practices followed and a history of pest attacks. 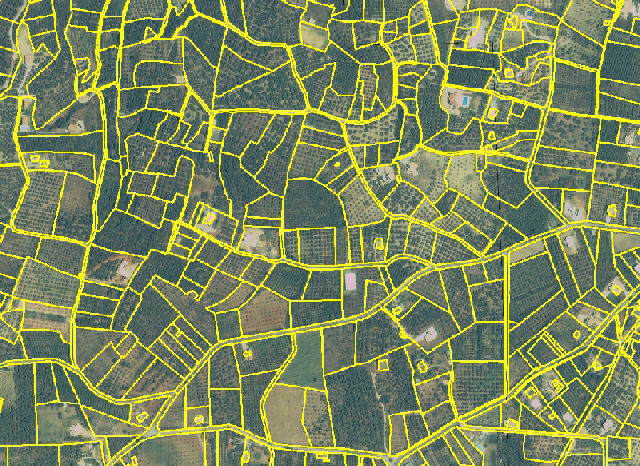 A vector layer over a true colour satellite image, showing different fields. 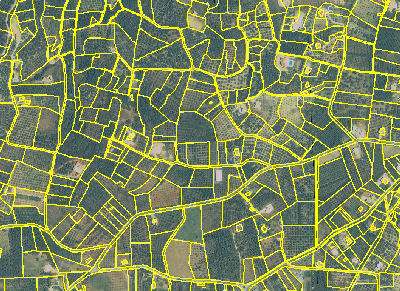 Recording of the field boundaries allows for the calculation of its total area, and this allows the estimation of the total crop production in that field. This method is used by the European Union, to determine the funding under the Common Agricultural Policy (CAP). Remote sensing data and the derived vegetation indices can be used to make estimates of crop yield, provided that a relationship between the index or indices and crop yield for the particular crop in the specific location has been established in the past. These are only rough estimates and are not 100% reliable. More accurate predictions require the use of models that combine those indices with ancillary data, such as meteorological data, farming practices, soil properties etc. These models are more adaptable because they consider parameters that are specific for the location, as opposed to the use of vegetation indices alone.